People around here are accustomed to coping with mud season and the muddy roads and deep ruts that are a part of every spring. Usually mud season is just an expected springtime inconvenience… but this year it has suddenly become much more unpleasant. We are stranded… literally stranded. Our road is completely impassable, and it has been that way now for nine long days. We are not alone. This town is made up of dirt roads, and almost all of these roads are also completely impassable. For three consecutive days last week the huge town graders drove past here in the morning and back again at night. There was also a convoy of gravel trucks going past throughout each of the three days. 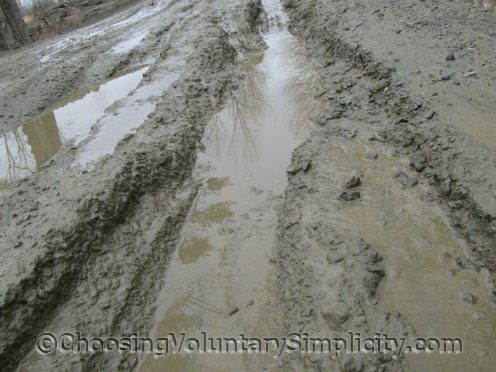 We were hoping they would do what the road crews have always done in the past… drop the blades and smooth out the worst areas or dump some gravel in the deepest ruts… but the trucks and heavy equipment didn’t stop. They did change things, though… all that weight has made the ruts we already had much deeper and the roads even more impassable. There are a few “Mud Ahead” signs posted along these roads, but they don’t accurately describe how deep the mud is, and unsuspecting out-of-towners are getting caught in this mess. In the last eighteen hours one car and four trucks have become so stuck in the mud just past our house that they are unable to get out. Luckily since we work from home we really don’t have to go anywhere urgently. And somebody HAS to do something to make these roads passable soon. And here I was thinking our road was muddy. I’ve never seen anything like this. Hope somebody does something soon. This is incredible. Great pictures too. They certainly tell the story. 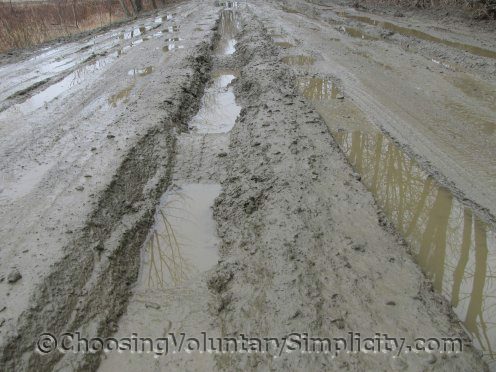 I’m a city girl and I don’t think I have ever even seen a dirt road let alone driven on one but I can’t imagine how *anyone* could have the dexterity to drive through that kind of mud. It must be an experience. Here’s hoping your roads are fixed soon. I’ve been reading your blog for a while now and just love it. Oh my gosh! You guys need swamp buggies! My dad (who some have described as a hillbilly redneck) used to get so excited during muddin’ season. He loved it more than the snow storms and would drive down by the levy and river looking for stranded cars to pull out with his muddin chains and big truck. 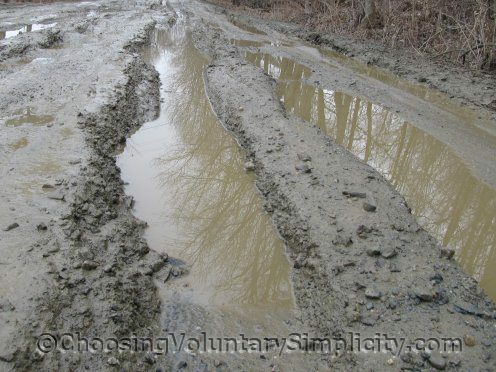 I’ve seen a lot of dirt roads and muddy ruts, but I don’t think I’ve seen any that bad. Hope it doesn’t last too long! Oh my gosh, Shirley! Please stay healthy. I would be so worried about needing assistance in an emergency. God Bless and keep you and yours safe. WOW! I hope by now things have gotten better and that those silly trucks would have stopped and rendered a hand…er…blade to help those in need! Have you tried flagging them down and asked why they have not helped as in years past? I hope today it gets better and passable/driveable. Grace, we haven’t seen any more trucks or road equipment. The roads are so bad there is no traffic at all. Even the UPS and mail service won’t deliver here any more. We’ve been calling the road crew’s phone number almost daily and asking them to do SOMETHING to the roads. Unfortunately we only get to talk to an answering machine, and there are so many roads in the same condition… I guess there really isn’t much they CAN do. We have NEVER been stranded like this before. Happily, the mud seems to be starting to dry out and firm up without intervention. We’re still stranded, though.